Investigating animal abuse and neglect is another reason many people contact the refuge. You may be reading this because you would like to report animal abuse or neglect, or you are unsure of the legislation in France. The first point to make about animal abuse or neglect is that it is often difficult for many people to understand that something they have seen is not tantamount to neglect or abuse. Indeed, a good part of my ‘refuge’ time is spent listening to people describe something they describe as abuse or neglect only to then find there is no case to answer. What people believe to be abuse or neglect is largely subjective and depends often on the situation. Indeed, many people may be alarmed to see a dog who looks injured or in a poor condition, only to realise later that the dog is old and is very well cared for. Many dogs find life indoors very distressing. Animal welfare is largely agreed to be composed of five “freedoms” which then go on to govern much animal welfare legislation in Northern Europe. This is as true for domesticated animals as it is for dogs and cats. These Five Freedoms are the basis of legislation in France concerning animal abuse or neglect. When investigating animal abuse or neglect cases, these are the rules we try to bear in mind. They are not always possible and neither are they enforceable. The owner must allow the animal access to appropriate food of a sufficiency to ensure the animal is kept in good health. The owner must allow the animal access to clean water in an appropriate, clean receptacle that is kept free from ice in winter. No animal should be shut in the boot of a vehicle that is not sufficiently aerated. Any animal shut in a parked vehicle must have sufficient air and must be parked in the shade. In case of injury or sickness, the owner is responsible for ensuring appropriate care. Please understand that what constitutes a space big enough for their physiological needs can be much smaller than you might imagine. Neither is any kind of heating generally needed unless temperatures are very low. However, it is not acceptable for animals to live permanently enclosed in unlit barns. A shelter of some kind providing protection from the sun, wind, rain or snow is usually sufficient. A dog who lives outside permanently with access to a three-sided kennel is not mistreated or neglected. Even a roof of some kind against a wall may be considered shelter enough. Any animal kept tethered (usually a guard dog) must have a collar and tether that are appropriate to its size and force. A chain in itself cannot be used as a collar. The tether mustn’t be too heavy. The chain or tether must be strong enough to protect any visitors. The chain or tether must be fixed either to a horizontal cable or be fixed appropriately to prevent the animal escaping. The tether must be at least 2.5m if attached to a horizontal cable, or be at least 3m if fixed to a permanent position. Choke chains, prong collars and slip collars are not permitted in these circumstances. 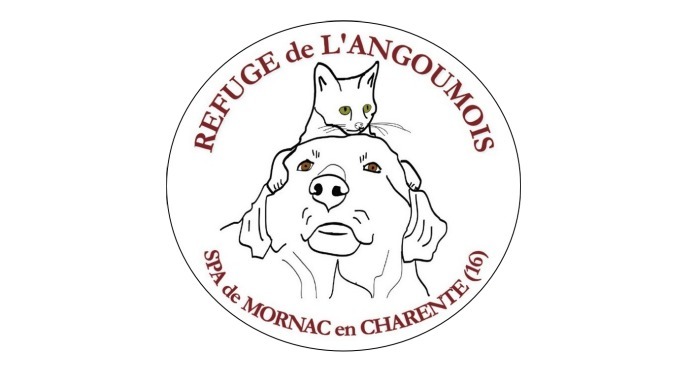 Usually, these organisations will contact the Refuge de l’Angoumois for further assistance on the ground because they do not always have representatives in the area. Under some circumstances, they will come from larger cities to investigate themselves. 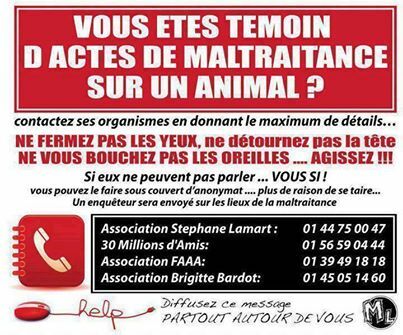 Please bear in mind that no animal welfare association in France has the right to investigate or to intervene. They do have experience at dealing with local police and mairies, however. They will have to contact the mairie at the beginning of the investigation. Animal welfare associations may ONLY seize animals when instructed to do so by the police, the state vet, procureur, or the mairie. Only these bodies can press charges against individuals. If you find that the police or mairie are unhelpful or unwilling to act, you may contact the procureur directly. Full details of the animals you have seen, including number, size and location. Photos if possible (clear ones will definitely help) or video footage. A description based on the points above of what conditions are not being met or how the animal is being harmed.